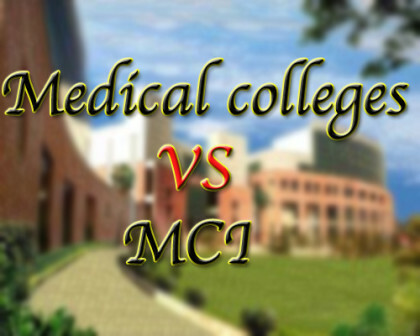 MCI has reportedly rejected the application by Deccan College of Medical Sciences (DCMS) asking for an increase in the MBBS seats at the college. DCMS had earlier filed an application for increasing the intake from the existing 150 to 200 seats. However, the situation went upside down after the report by MCI assessors, who claim there are several deficiencies noted in the college, as per the MCI prescribed norms. In addition, it has also decided to issue a show-cause notice to the college over the matter. The matter has now become very serious as the MCI team is now questioning the college authorities as to why they should not withdraw recognition even for the existing course at DCMS. The proposed increase of 50 seats by DCMS was for the 2016-17 session, and has now been completely refuted by the MCI after certain observations made by the inspection team, who visited the college on January 21 and 22. It has been alleged that the Deccan college fails eligibilty rules, such as not complying with the norms relating to faculty and other departments. The appointed MCI assessors have submitted the report to the executive committee of the MCI, which later decided to reject the application by DCMS. As reported by Deccan Chronicle, It said: “The applicant college does not meet the qualifying criteria 6(a)(ii), 6(a)(iii) and 6(a) (iv) of opening of new or higher courses of study or training (including postgraduate course of study or training) and increase of admission capacity in any course of study or training. It decided to invoke its powers under clause 8(3)(1)(c) of Establish-ment of Medical College Regulation (Amendment) Act, 2010 and serve a show-cause notice. When contacted, a senior official from DCMS who wished not to be quoted said: “We are in the process of rectifying all the deficiencies.” The principal and CEO of DCMS said that only managing director of DCMS, Mr Akbaruddin Owaisi, was authorised to speak on the issue.